As you may or may not have noticed, our anime coverage has been a bit sparse lately, courtesy of some writing gigs I’ve picked up elsewhere on the Internet. This will hopefully mark the return of regular anime content here on SharkPuppet.com, albeit with a few format changes. This Week in Anime will be following a less formal structure for its articles, and will serve as a general-purpose commentary column on current events in the world of anime and manga. Kawaii Overthink will eventually return as well, but as a less frequent, in-depth analysis kind of deal. With that housekeeping out of the way, let’s get right to it. The fall season is here, and it’s brought a fresh slate of interesting shows. A new version of Fate/Stay Night has been grabbing a lot of attention with some quality writing and animation. Think of it more as a sequel to the fantastic Fate Zero than a remake of the comparatively flawed 2006 version. Speaking of sequels, holy crap there are a lot of sequels this season. We’ve got continuations of Psycho-Pass, Mushi-shi, Yowamushi Pedal, Chaika The Coffin Princess, and probably a few more that I can’t think of offhand. The new season of Psycho-Pass has some new people in key positions on the production staff, so folks are rightly concerned that it might not live up to the original. As for the rest, it looks like we’re in for more of what made earlier seasons good. Works for me! The anime adaptation of Terraformars has been causing some controversy thanks to its graphic violence. More accurately, the general harrumphing has been about a conspicuous lack thereof. The “Humans vs. Space Cockroaches” series has been running with some frequent and severe visual censorship, and black circles and rectangles have been slapped over any instances of blood and gore. I tend to prefer minimalist or psychological horror myself, but censoring the violence in a series like Terraformars makes as much sense as obscuring the sight gags in a comedy. The good news is that Crunchyroll is in the process of acquiring an uncensored version for their simulcasts. The beginning of a new season is always exciting, and just about any series has a chance to turn into something awesome. Well, maybe not Cross Ange, but I’m not going anywhere near that landmine. Instead of covering a current simulcast AND a physical release every week, I’m just going to have a general-purpose weekly spotlight section from now on. 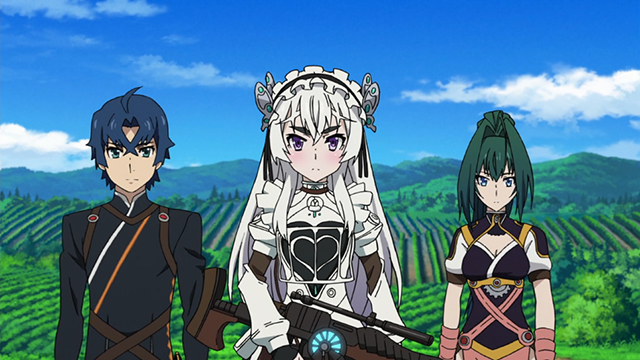 To kick things off, I’ll be highlighting the new Chaika season. By-the-book genre fiction doesn’t get as much love amongst fans and critics as original content, but there’s something to be said for telling an old story really well. I would’ve passed Chaika over if I weren’t covering this season for another site, and boy was I missing out. It’s a fairly standard case of teenagers with magic powers trying to collect all the important plot devices, but it’s made with plenty of style and intelligence. The cast delivers satisfying drama, fun humor, and exciting battle scenes in equal measure, and the animation is always competent enough to keep up with the script’s ambitions. Coffin-toting heroine Chaika is a delight. Her character design and quirky speech patterns are enough to charm the jaded otaku crowd, but she’s also complex and self-assured enough to win over the rest of the audience. She fights with a comically oversized magical rifle, which is somehow still effective as a visual gag after all these years. What surprised me while I was binge-watching the first season was the amount of thought and insight hiding inside the story. The series deals with issues of identity, morality, and loss in a post-war reconstruction setting. More impressively, it does all that without sticking its foot in its mouth. Chaika reminds me a bit of “magical battle road trip” classics like Fullmetal Alchemist, and has that same kind of appealing accessibility. If you’re in need of a current simulcast to recommend to an anime newcomer, look no further. Speed your way through the first season before while it’s still a quick catch-up process. That’s all for this week. Come back next week when I finally get back on a regular schedule and maybe even make a logo for this column.